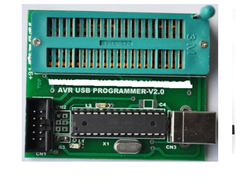 AVR USB ISP STK500 is a high speed USB powered STK500 compatible In-System USB programmer for AVR family of microcontrollers. It can be used with AVR Studio on Win XP platforms. For Windows7 it can be used in HID mode with Avrdude command prompt as programming interface. Its adjustable clock speed allows programming of microcontrollers with lower clock speeds. The programmer takes power directly from PC’s USB port which eliminates need of external power supply. 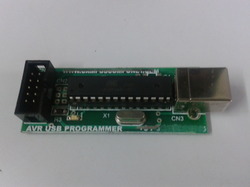 The programmer can also power the target board from PCs USB port with limited supply current of up to 100mA. AVR microcontrollers can be programmed without removing it from existing hardware. Supports AVR DUDE programming utility from WIN AVR. Target can be directly powered from the programmer. Works under multiple platforms like Linux, Mac OS X and Windows. ISP Programming FRC Socket provided. It can program directly 40 pin Chip with the help of ZIF socket provided. Note: If mode is HID, insert HID/CDC jumper (J2) and if mode is CDC, remove HID/CDC jumper (J2).